The open-character villa features a spacious livingroom ,a fully equipped kitchen, three bedrooms,all with a/c and ceilingfans ,three bathrooms , a large outdoor terrace of 80 sq. metres, a large pool of 12x6 meter right at the beach and a bale benong,the best place to relax in the shade while enjoying a seabreeze. 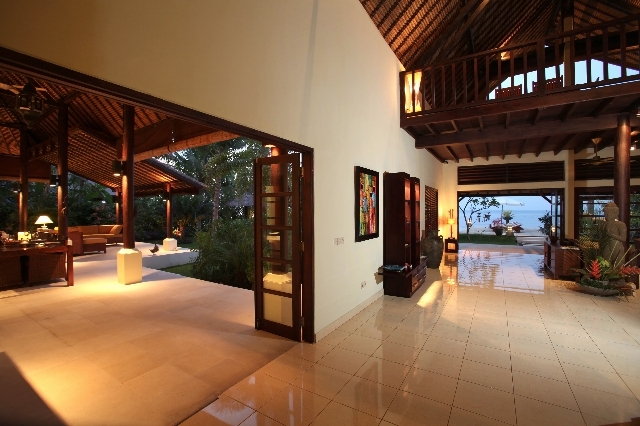 Upstairs is a mezzanine with a beautifull sight over the Balisea. Two of the bathrooms have an open character. There are various places to enjoy the sun,next to suncovered seats and parasols Most of your time you will live outside either on one of the terraces or in the lounge-area. The three staffmembers will take care of you 8 hours a day, 6 days a week. Massage at the premises can be done by our house masseuse. Special features The villa is surrounded by a large tropical garden with easy access to the pool and the beach. You will surely enjoy the comfort and quietness of this villa Housecleaning, cooking, gardening, poolcleaning and security will be done by the staff.